Ski goggles are an essential part of your equipment out on the slopes. They offer safety, comfort and a level of visibility designed uniquely for snow sports. First of all, they offer protection from the cold and from debris. Goggles, unlike sunglasses, outline the eyes with a foam contour that hugs the face and prevents wind, snow and other particles from coming into contact with your eyes. Who wants to go down the run with tears streaming down their face? They also reduce glare and increase contrast for better visibility. Snow is tricky to see when the sun reflects brightly on the surface or when there is not enough light to discern bumps and other obstacles. The two most important points in finding the right goggles are fit and visibility. If they don’t fit very well, they can bring discomfort to the bridge of your nose or along the cheeks. The best way to find a good fit is to try a few on with your helmet. So don’t be afraid to bring your helmet into the store when you go shopping, or bring your goggles with you when shopping for a helmet. The top part of the goggles should follow the curve of the helmet for optimal comfort and warmth; also there should be minimal space on either side of the eyes. Brands offer many models for different face shapes and sizes, so you can find the perfect fit. Visibility is determined by peripheral view and lens color. Your goggles should allow you to have a peripheral view of about 180° in order to see oncoming skiers or obstacles. The lens color is determined by where you ski, when you ski… If you have a tendency to ski on bright sunny days in slopes like the ones on Versant Soleil, you will probably want a darker tint for protection from direct sunlight and harsh reflections from the snow. Darker tints will keep your eyes more comfortable while they increase contrast. If you prefer skiing the glades over on The Edge all day long, a lighter tint is preferable to better distinguish bumps. In low light and fog, yellow, gold and amber lenses filter out blue light, emphasizing shadows in the snow. The goal is to get the tint that will provide a good combination of color definition, depth perception and light protection. The visible light transmission (VLT) is a good index for choosing a lens. 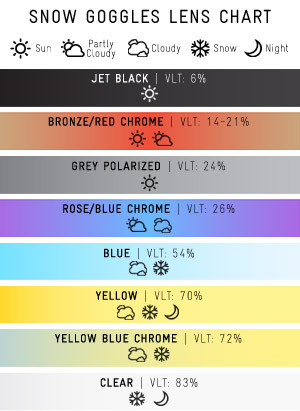 A low VLT number, such as 6%, means less eye fatigue on sunny days and a high VLT number, such as 83%, means better color and depth perception on low-light days. To the side is the VLT chart for Oakley lenses. 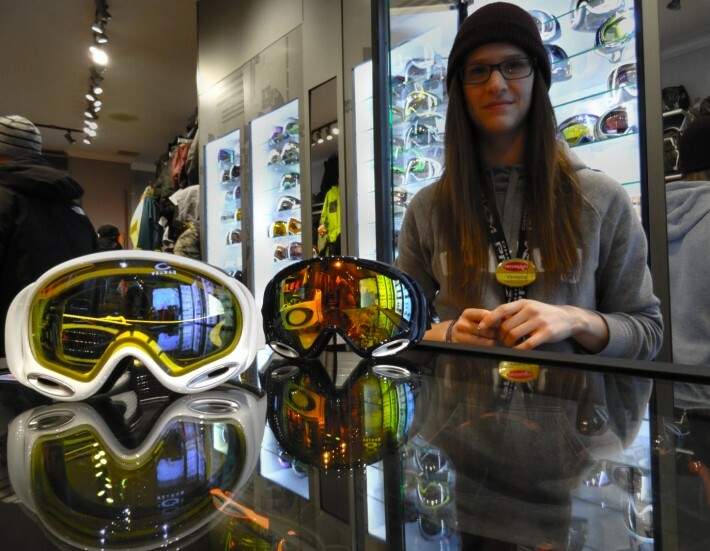 For more information on finding the right snow goggles, feel free to ask our helpful staff over at the Oakley Tremblant boutique or our other Tremblant stores. A month away from opening, the first snow! Moonlight, snow and cheese: an unforgetable girls night!